The SuperMount 68 simplifies the task of installing a top quality wall-mounted basketball structure. 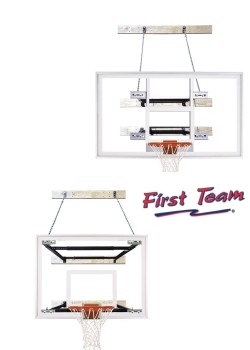 Never before has it been so simple to purchase and install a commercial quality wall-mounted basketball system. With First Team's SuperMount 68 there is no need to calculate exact extension before ordering. The SuperMount 68 is specifically designed to provide wall-to-backboard extension distances anywhere from 6' - 8' during installation. This allows the unit to be "fine-tuned" to match the court markings on the floor. You will avoid costly rework and field modifications commonly caused by measurement errors. Additionally, the SuperMount 68 is so versatile is can be configured to match up to any basketball backboard. So, no matter what backboard you prefer, you know the SuperMount 68 is compatible.